String the beads for the dangle on a headpin and make a wrapped loop. Put this dangle on a jump ring. Cut eight 3" lengths of wire. String on a 4mm pearl, 5mm crystal, beadcap, 7mm pearl, beadcap, 5mm crystal, and 4mm pearl. Make half of a wrapped loop at each end of the wire. Connect the two 1/2" sections of chain to the jump ring with the dangle, forming the center of the necklace. Attach the beaded wires to the chain sections and complete the wrapped loops. Attach the trigger clasp to the remaining 1" section of chain with a jump ring. Attach the 3" section of chain to the remaining beaded section with a jump ring so the length of the necklace can be adjusted. Add a decorative dangle at the end of the chain, if desired. 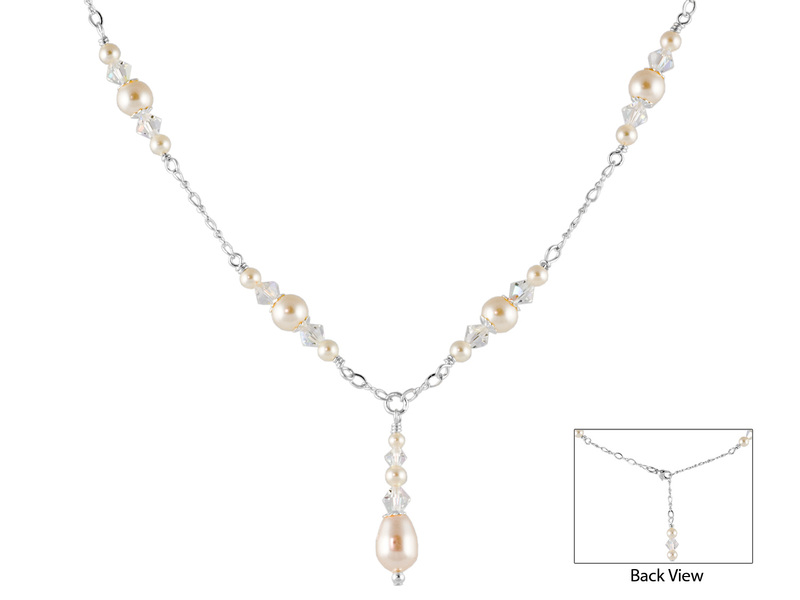 Please note that this necklace was originally made with 7mm cream pearls which have since been discontinued. We have replaced them in our item list with 8mm cream pearls.